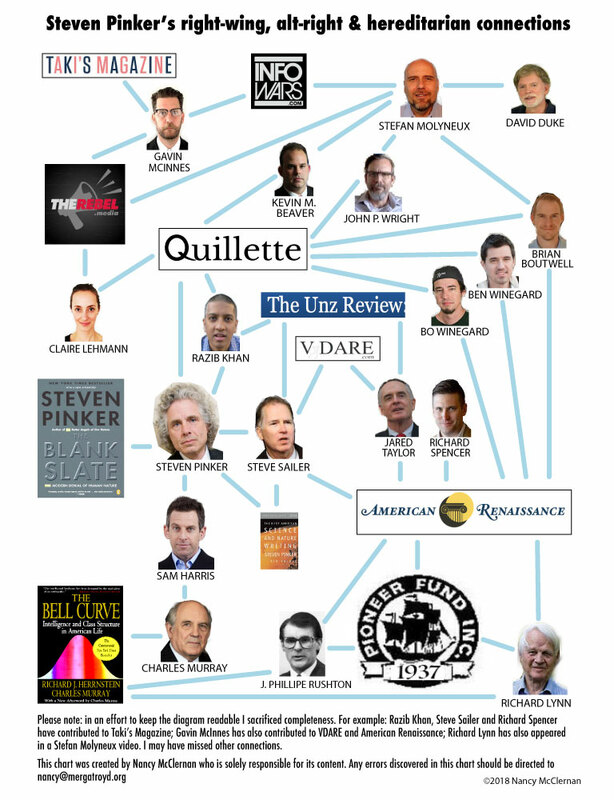 I have added Sam Harris to the chart in honor of his shout-out at the Southern Poverty Law Center. The series on "evo-psycho bros."
"Hereditarian" - an advocate of the theory that individual differences in human beings can be accounted for primarily on the basis of genetics. Quillette is an online magazine founded by Australian writer and former psychology graduate student Claire Lehmann. The publication has a primary focus on science, news, culture, and politics... The magazine has been praised by the evolutionary biologist and writer Richard Dawkins, who described it as a "superb online magazine", and has garnered support by the psychologist Jordan Peterson. Renaissance including Kevin M. Beaver, Brian Boutwell, Ben and Bo Winegard and John P. Wright. ...Australian writer and the editor and founder of the online magazine Quillette. Before starting Quillette, I was a grad-student in psychology, but dropped out after having a baby. I graduated from The University of Adelaide with First Class Honours in 2010. I’ve written for Quillette, Commentary Magazine, Psychology Today, The Sydney Morning Herald, ABC’s The Drum, and my essays have been cited in the National Review, The Wall Street Journal, The Australian, and The Spectator. I live in Sydney with my husband and two children. Benjamin Winegard is an Assistant Professor at Carroll College. Bo Winegard is an essayist and a graduate student at Florida State University. Professor, University of Cincinnati... He currently teaches Biosocial Criminology at the undergraduate level and Life-Course Criminology and Criminal Offender at the graduate level. ...Self-control and IQ covary, so that individuals with low self-control are also more likely to have low IQ. These deficits are potent enough to predict many of the negative life-course factors that afflicted individuals will experience. Longitudinal analyses of cohorts of individuals demonstrate that these individuals will face multiple problems across their life- course and that their self-limiting choices will show a high degree of continuity. Most will fail at their education and will then encounter problems in employment… They likely will live a fluid existence, relocating from place to place but often within the same economic stratum (Wright & decker, 1997). Finally their relationships will frequently be marred by conflict, unfaithfulness and unreliability. This pattern holds for anyone with deficits in executive control functions, black, white or Asian, but due to the distribution of low IQ and low self- control found in black populations, it is more often reflected in the lives of blacks. A skilled propagandist and an effective communicator within the racist “alt-right” and pro- Trump ranks, his promotion of scientific racism and eugenics to a large and growing audience is a serious concern. Molyneux has been delivering “race realist” propaganda, based on pseudo-scientific sources, to his audience on an ongoing basis for over two years, and thus has encouraged thousands of people to adopt his belief in biological determinism, social Darwinism and non-white racial inferiority. Molyneux puts considerable effort into cloaking the practical implications of these beliefs across his media platforms. Founded by Jared Taylor in 1990, the New Century Foundation is a self-styled think tank that promotes pseudo-scientific studies and research that purport to show the inferiority of blacks to whites — although in hifalutin language that avoids open racial slurs and attempts to portray itself as serious scholarship. It is best known for its American Renaissance magazine and website, which regularly feature proponents of eugenics and blatant anti- black racists. The foundation also sponsors American Renaissance conferences every other year where racist "intellectuals" rub shoulders with Klansmen, neo-Nazis and other white supremacists. analysis of social problems,” which translates to promoting racist research by Lynn and several of his colleagues and collaborators......He has contributed to several white supremacist publications including VDARE.com, The Occidental Quarterly, and American Renaissance. He also sits on the editorial committee of Mankind Quarterly, a pseudo- scholarly journal dedicated to publishing “articles in controversial areas, including behavioral group differences and the importance of mental ability for individual outcomes and group differences” — a thinly veiled admission that they primarily print racist pseudoscience. Now, as race science leaches back into mainstream discourse, it has also been mainlined into the upper echelons of the US government through figures such as Bannon. The UK has not been spared this revival: the London Student newspaper recently exposed a semi- clandestine conference on intelligence and genetics held for the last three years at UCL without the university’s knowledge. One of the participants was the 88-year-old Ulster-based evolutionary psychologist Richard Lynn, who has described himself as a “scientific racist”. The “skeptics” movement — whose adherents claim to challenge beliefs both scientific and spiritual by questioning the evidence and reasoning that underpin them — has also helped channel people into the alt-right by way of “human biodiversity.” Sam Harris has been one of the movement’s most public faces, and four posters on the TRS thread note his influence. Harris defended his views in his argument with Ezra Klein about the Murray podcast by providing a link to an article by Bo Winegard and Ben Winegard in Quillette, "A Tale of Two Bell Curves" which argues that The Bell Curve is correct about lower inherent black intelligence and in fact states that "no good alternative explanations" to the hereditarian position exist. Quillette published an article in support of Harris. Harris and Pinker have a mutual admiration society as can be seen in this video. And in tweets such as this. “You want to have a job training program for welfare mothers? You think that’s going to cure the welfare problem? Well, when you construct that job training program and try to decide what jobs they might qualify for, you had better keep in mind that the mean IQ of welfare mothers is somewhere in the 80s, which means that you have certain limitations in what you're going to accomplish.”—Interview on race and IQ, “Think Tank with Ben Wattenberg,” PBS, 1994.